This is your chance to try out my Read it, Bead it center for FREE!!! 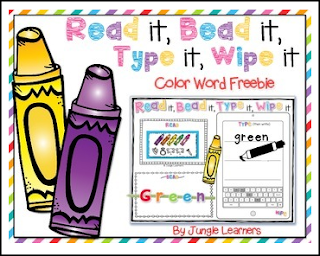 This is a fun literacy center color word FREEBIE for anytime of the year that will definitely help keep your students engaged. There are 16 color word cards included. Instead of it having the word on each card, there are pictures of each letter's beginning sound. Students have to determine what the beginning sound it and put them all together to form the words. After determining the letters in the word, students will use letter beads and pipe cleaner to bead the word. You can use any kind of letter beads for this. There is 1 recording sheet included that can be used for your students to keep track of which words they have completed. Please make sure to look at the preview and feel free to ask any questions you may have! If you’re interested in saving 20%, then purchase a bundle! *This unit is for the sole use of the purchaser. *This unit may be reproduced for the purchaser's classroom only. *The purchaser may NOT use this unit to create items for sale or free download.